Evil energy is our brand,we're a direct and professional manufaturer in China,one of greatest manufacturer and exporter in Tuning parts include intake system,exhaust system,engine system,cooling system,interior&exterior parts. Accept customized order with minimum quantity. Fit for : 2.5 Inch O.D. Pipe . "Male/Female" design to ensure proper alignment of the flanges inside the clamp. 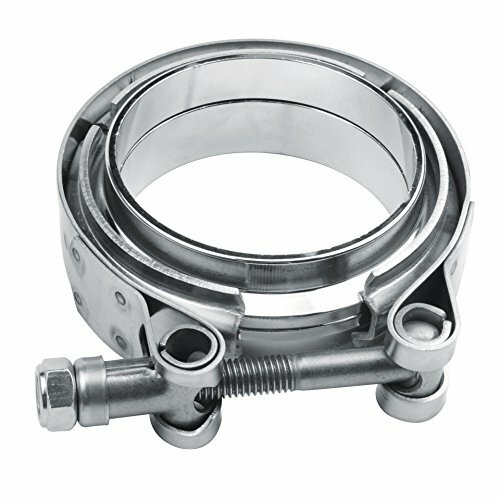 This flange assembly consists of V-band flanges, pressure seal o-ring and V-band clamp . Material: Mild steel Flange+Stainless Steel Clamp. Package : 1 pc . Vibrant Performance V-band flange assemblies feature a unique "Male/Female" design to ensure proper alignment of the flanges inside the clamp. Each assembly consists of two Mild Steel Male Female flanges and one 304 Stainless Steel V-band clamp. If you have any questions about this product by evilenergy, contact us by completing and submitting the form below. If you are looking for a specif part number, please include it with your message.